The Federal Reserve is set to make its latest policy announcement on Thursday, and it's probably the most anticipated decision of the entire year. Here we'll explain what all the hubbub is about. Historically, the Federal Reserve has cut interest rates when the economy is weak (to stimulate the creation of credit) and raised interest rates when the economy was getting too strong (and inflation was getting out of control). During the financial crisis, the Fed cut rates to about 0%, meaning that since then it's had to find new and creative ways to cut rates, since it can't cut rates to below 0%. The Fed's primary tool has been Quantitative Easing, which means that the Fed goes out and buys US government bonds (and sometimes other stuff like Federally guaranteed mortgage backed securities) with the aim of pushing money into riskier areas of the market, and hopefully increasing the value of all assets, and stoking some inflation. The Fed has done two rounds of QE, and a round of something called Operation Twist, which is pretty similar to QE. The belief among many is that a new round of QE will likely be announced tomorrow..
Because the economy is still really disappointing, and unemployment is way too high, and at its last meeting, the Fed gave a strong hint that it would ease more if things didn't improve. The Committee will closely monitor incoming information on economic and financial developments and will provide additional accommodation as needed to promote a stronger economic recovery and sustained improvement in labor market conditions in a context of price stability. Participants discussed a number of policy tools that the Committee might employ if it decided to provide additional monetary accommodation to support a stronger economic recovery in a context of price stability. One of the policy options discussed was an extension of the period over which the Committee expected to maintain its target range for the federal funds rate at 0 to 1/4 percent. It was noted that such an extension might be particularly effective if done in conjunction with a statement indicating that a highly accommodative stance of monetary policy was likely to be maintained even as the recovery progressed. Given the uncertainty attending the economic outlook, a few participants questioned whether the conditionality of the forward guidance was sufficiently clear, and they suggested that the Committee should consider replacing the calendar date with guidance that was linked more directly to the economic factors that the Committee would consider in deciding to raise its target for the federal funds rate, or omit the forward guidance language entirely. Participants also exchanged views on the likely benefits and costs of a new large-scale asset purchase program. Many participants expected that such a program could provide additional support for the economic recovery both by putting downward pressure on longer-term interest rates and by contributing to easier financial conditions more broadly. In addition, some participants noted that a new program might boost business and consumer confidence and reinforce the Committee's commitment to making sustained progress toward its mandated objectives. Participants also discussed the merits of purchases of Treasury securities relative to agency MBS. However, others questioned the possible efficacy of such a program under present circumstances, and a couple suggested that the effects on economic activity might be transitory. In reviewing the costs that such a program might entail, some participants expressed concerns about the effects of additional asset purchases on trading conditions in markets related to Treasury securities and agency MBS, but others agreed with the staff's analysis showing substantial capacity for additional purchases without disrupting market functioning. Several worried that additional purchases might alter the process of normalizing the Federal Reserve's balance sheet when the time came to begin removing accommodation. A few participants were concerned that an extended period of accommodation or an additional large-scale asset purchase program could increase the risks to financial stability or lead to a rise in longer-term inflation expectations. Many participants indicated that any new purchase program should be sufficiently flexible to allow adjustments, as needed, in response to economic developments or to changes in the Committee's assessment of the efficacy and costs of the program. So at the last meeting they said they were prepared to do more and they even talked about ths specifics of what they might do. Possibilities, as they say above include a change in guidance, and another Large Scale Asset Purchase Program (AKA: QE3). So what will they actually do? Opinions are all over the map. Some think the Fed will merely extend its guidance about when a rate hike will come from 2014 to 2015. Goldman is expecting something it calls a "double punch" which would mean that the Fed extends its low rates guidance and initiates QE3. A combination of large-scale asset purchases (QE) with a lengthening of the forward guidance for the funds rate from late 2014 to at least mid-2015. This is our baseline expectation. It is in line with the policy options discussed in Chairman Bernanke's Jackson Hole speech, as well as the minutes of the July 31-August 1 meeting. Both of these gave a prominent role not just to forward guidance but also to QE (the chairman's speech mentioned it first). Moreover, it is at this point widely expected in the financial markets, which somewhat raises the cost of not delivering it. A more substantial enhancement of the forward guidance, perhaps to the point of adopting the 7/3 rule—no hikes until the unemployment rate has fallen below 7% unless inflation rises above 3%—proposed by Chicago Fed President Evans. But this is less likely, in our view. The FOMC probably feels that if it failed to deliver on expectations of renewed QE—which are of course largely based on its own communications—it would need to make up for this by not just lengthening but also substantially revamping the guidance. However, we suspect that the committee is not yet ready for an Evans-style 7/3 rule. Again, something like an "Evans-style 7/3 rule" seems unlikely, as Goldman notes, but it is also the direction that monetary policy is moving in. That would be one step short of at economist Michael Woodford famously proposed at Jackson Hole, which would be for the Fed to shoot for a Nominal GDP Level, and promise not to east until its hit. As Hatzius says, we're probably not there yet, but it will be very interesting to see if Bernanke (at the press conference) expounds further on the Fed's move towards some kind of conditional guidance. All in all, the QE question seems like something of a coinflip. 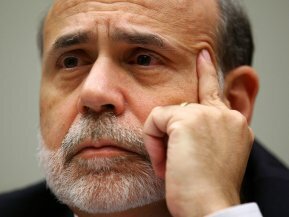 The economy is weak, and Bernanke just gave a speech at Jackson Hole, less than two weeks ago, talking about how well QE worked. On the other hand, Europe may have turned a corner, and the economic data is marginally better than it was in early August. Also, it's election season, and any new "money printing" will be controversial. At a minimum, everyone expects some kind of language change (verbal easing). Obviously, we'll be covering the events LIVE here tomorrow. The Fed's announcement comes at 12:30, and then that's followed up with a press conference at 2:15.